Can You Count on Popular Diet Programs to Lose Weight? I once had a client say to me that she wanted to lose weight, but she just hadn’t found the right diet yet. She went on to explain that she had tried many popular diet programs over the years, but none of them ever worked for her. When I probed further to find out what she did and didn’t like about the diets she tried, I discovered she had successfully adopted several new eating behaviors from each one. What she didn’t realize was that she was customizing her approach to healthier eating habits with each change she made, and creating a plan that would work for her for over the long run. If you’re hoping to start the New Year off by making a resolution to lose weight, there are many things you can learn from all of the popular diet programs out there. While you may not be able to adhere to all of the recommendations, all of the time, any change you make that improves what and how much you eat – and that you can stick to – is a win for you! Over the years I have had clients tell me they started to eat breakfast regularly after being on a popular diet, even though they dropped the rest of the plan. Others have said they started using a no-calorie sweetener, like SPLENDA® Brand, instead of sugar as part of a diet program and continued using it long after giving up on the rest of the plan. And then there are those who formed the habit of eating a salad before dinner each night, or bringing a piece of fruit to work to snack on in the afternoon every day, even though they skipped the rest of the “rules”. These are all success stories in my book. Read on to see how you can take what you need from the most popular weight loss diets while leaving behind what you don’t. What are the Best Diet Programs or the Best Weight Loss Diet? Numerous well-controlled studies designed to compare the effectiveness of different weight loss diets with different compositions of fat, protein and carbohydrates, have found they all result in weight loss if you stick to them. Initial rates of weight loss vary from one plan to another, but over time they even out to about the same number of lost pounds as long as you keep following the rules. Of course, once you stop following the rules, some or all of the weight is regained. Some of the riskiest diet plans are those that promise quick weight loss. Tempting as they may sound, they do not result in weight loss that lasts. And they often have more extreme food restrictions that can lead to nutritional imbalances. This is not a solution even for the short term. To avoid diet lapses and weight gain you need to establish some new eating habits that are compatible with your way of life, yet make it possible to maintain a healthier weight. The best way to figure out what approach will work for you is to consult with a registered dietitian/nutritionist or other qualified health professional. If that is not an option, use the steps below to rate the popular weight loss diet plans. The first thing you should do to evaluate any weight loss program is check out the food or meal replacement products you’re expected to eat. If you don’t like, can’t easily buy, don’t know how to prepare or can’t afford most of the recommended foods, then don’t even consider starting the diet. If, however, there are foods you have tried and liked but don’t regularly eat, like beans or fish, you may have to up your game to include them more often. If the plan is based on buying special foods or meal replacement products, ask yourself if that’s a sustainable option for you. The next thing to do once you’re satisfied with the foods you’re allowed or expected to eat is to see if there are any “forbidden” foods. Now ask yourself: could you live without them for the rest of your life? If entire food groups are omitted, such as grains or dairy, it may be best to keep looking for a more balanced plan. After you find a plan that is a good match for your food preferences, look at the recommended eating schedule to see if it fits in well with your daily routine. There is no point in starting a plan that expects you to eat every two hours or have your main meal at midday or stop eating by 6pm if that’s not possible for you. You will also want to know what other activities you’ll have to fit into your life, like exercising, attending meetings or completing records, and make sure those requirements are realistic for you. There is no one weight loss diet that is right for everyone, so make it your goal to adopt healthier eating habits that are right for you and can last a lifetime. This post originally appeared on SplendaLiving.com. If you’re looking ahead to the New Year and dreading the thought of starting another weight loss resolution that will leave you feeling hungry all the time, you may want to check out the concept of “Volumetrics”. It’s all about feeling full while trying to lose weight. Imagine being satisfied at the end of each meal, and between meals, with no hunger pangs to derail your commitment. Now that’s a diet you can stick to for life! Volumetrics was developed by Barbara Rolls, Ph.D., Professor of Nutrition at Pennsylvania State University. Based on her research on meal plans made up of different types and amounts of foods, she found that eating more foods with “low energy density,” rather than ones with a “high energy density,” can help you lose weight without feeling hungry. The energy density of a food is the number of calories (“energy”) in a certain amount of that food. Foods with a high energy density have more calories by weight than foods with a low energy density. Since we tend to eat the same amount of food each day, Dr. Rolls proved that by choosing foods with a lower energy density we could eat the same volume of food and lose weight without feeling deprived. The biggest difference between the foods with high energy density compared to those with low energy density is their water content. Water has no calories, but does add weight to foods, so foods that are mostly water, like fruits and vegetables, have relatively low energy density. For example, 16 ounces of carrots have roughly the same number of calories as one ounce of peanuts; however, eating 4 large carrots weighing one pound is more filling than eating 28 peanuts that weight one ounce. Another way to see how water content affects energy density is by comparing fresh fruit to dried fruit. If you have a dish with 20 fresh seedless grapes in it, they will weigh about 100 grams and contain 70 calories. When the water is removed from those grapes to make raisins they will shrink in weight to just 8 grams, and fill less than one tablespoon, but still contain 70 calories. Adding more fruits and vegetables or liquids to recipes for soups, stews and casseroles is a way to make those dishes have a lower energy density, along with reducing the amount of fat they contain. When you do that, if you eat the same portion you are used to having, it will provide fewer calories yet leave you feeling satisfied. The key to including these higher fat/high energy dense foods in your Volumetrics diet is to combine smaller portions of them with low energy dense foods. Good examples are blending chopped mushrooms into your ground beef for burgers, sprinkling toasted nuts on a salad rather than eating them out of hand, and pairing an ounce of cheddar cheese with an apple instead of a stack of crackers. Most beverages are more than 90 percent water so they have low energy density, even if they are relatively high in calories. However, Dr. Rolls’ research found that drinking more beverages, even plain water, does not provide the same satiety as eating low energy dense foods. The main reason to include plenty of water and low calorie beverages in your plan, like those sweetened with SPLENDA® Sweeteners, is to satisfy your thirst so you don’t confuse it with hunger. And it’s a valuable way to avoid adding unwanted calories from higher caloric drinks. Here’s wishing you a very healthy and happy 2017! Avoiding weight gain between November and January is all about changing what you’ve been doing year after year that has contributed to the inevitable extra pounds you see on the scale on New Year’s Day. If you’re ready to do something different, I’ve got some suggestions to help you get started! When you look back on how you’ve celebrated the year-end holidays in the past, what patterns of behavior do you see? Are you making several late night trips to the mall to do your shopping, spending every weekend decorating the house and socializing more frequently with friends after work? Does that leave you with less time to prepare and eat meals at home, keep up with your regular workouts, and take the dog for a walk? Start your shopping and decorating earlier. Invite friends over for pot luck meals instead of eating out. Plan fun activities you can do with family and friends, like ice skating, walking for a cause, biking through the neighborhood to see the holiday decorations. Give yourself a curfew on week nights so you’re home and in bed on time to get a good night’s sleep. What you are thinking as the holidays approach can also influence how you will behave. If you have the attitude “anything goes” because holiday foods are only available once a year, you can end up eating and drinking more than you can possibly enjoy. By changing your mindset to focus on the meaning of all those special foods, you can put the brakes on overeating and savor the memories. Get built-in portion control at holiday meals by swapping out your large festive plates and bowls for smaller ones, as covered in this earlier blog. Have everyone around the table share a memory of when they first tasted their favorite dish including how old they were, who prepared it, and where they were. Make a video of a parent or grandparent preparing a special recipe to share with the rest of the family. Ask yourself what really matters the most to you as you anticipate each holiday, and then make sure you manage your time and resources so you can participate in those events instead of spending so much time at unfulfilling obligations carried over from year to year. Sometimes all it takes is letting go of a few items lower down on your “to-do” list so you can add something new on top. And remember that having healthy holidays is one of the best ways to have happy holidays. Prepare a lower sugar version of a few favorite holiday recipes by swapping out sugar for SPLENDA® Sweetener Products (as described in this blog) to balance out your menu without giving up the sweetness of the things you love. Make an appointment now to volunteer at a local soup kitchen, visit a house-bound neighbor, pack gifts to send to soldiers overseas, or wrap gifts for needy children. Donate the cookies from your annual cookie swap to a nursing home so you won’t have to give up the fun of baking them, but can avoid the temptation of eating them. Move up your annual New Year’s Resolution to lose weight by one month and make a December 1st No Weight Gain Resolutionso you can ring in the New Year without those extra pounds. This blog was originally posted on Aspartame.org. One of the best things about the holidays is the chance to spend time with the people we don’t get to see as often as we’d like throughout the year. But getting together with far-flung family and friends means we have to spend some time traveling. Packing the right clothes for your final destination may be top of mind, but it’s important to consider the foods you’re going to pack for the trip so you can have a healthy journey. Anything you bring to the airport to eat or drink on the plane must pass through the X-ray machine at the Transportation Security Administration (TSA) checkpoint. Liquid and gel foods larger than 3.4 ounces are not allowed in carry-on luggage, just like the restriction on other liquids. Hummus and yogurt fall into this category so consider packing them in smaller portions or substituting with solid foods if you are hoping to eat them on board. The TSA Liquid Rule also applies to any food gifts you may have packed in your carry-on bag, even if wrapped. Keep that in mind and pack these products in checked luggage or mail them in advance so precious gifts are not thrown away. Food items taken through security must be either whole, natural foods, like a piece of fruit, or foods in a container (salad) or wrapped (sandwich). No open food is allowed, such as an unwrapped donut or slice of pizza, since they can contaminate the security equipment. Consider purchasing additional foods and beverages after you have cleared security checkpoints. There are no restrictions on foods and beverages purchased in the terminal or Duty-Free stores after you have passed through security. Given the close quarters in airplanes, however, it does make sense to select items that are easy to eat and without strong odors. Individually wrapped granola bars are a good choice. A tray of sushi is not. Additionally, be sure to bring and refill your own water bottle and take advantage of any free in flight beverage service to stay properly hydrated in the air. Even on flights under two hours, you will probably get hungry before reaching your destination if you consider your travel time to the airport and waiting at the gate. I count on a small bag of mixed nuts to hold me over since I can pack them or buy them at kiosks at most airports. Eating my snack with a complementary can of diet soda on the plane means I am less tempted to order something from the in-flight menu. Whether traveling by plane or automobile, you’re going to spend a lot of time sitting so you won’t be expending much energy in transit. This means you won’t need high caloric foods to sustain you along the way. While there are more places to buy food on the road than in the air, you’ll have to resist all the tempting fare lining the shelves and select the healthy, low-calorie options. One way around that is to plan your pit stops so you know where the better roadside eateries are on your route and what’s on the menu. Another option is to BYOCF (bring your own car food). I recommend eating a meal before you leave and packing a small cooler with individual “road food” bags for each person, similar to packing lunches for school or work. Sandwiches can be made to order, choice of fruit can be packed whole or peeled and sectioned, and preferred vegetables can be combined with a favorite dip in containers. Pre-frozen non-carbonated diet drinks and single pack light yogurts can be used to help keep things cool. And if you want to include chips and other snacks, it’s best to get the small individual bags or pre-portion them at home to help with portion control. Don’t forget to include plenty of ways to keep little ones entertained so they don’t resort to mindless eating just to pass the time. By starting out with the appropriate foods and beverages needed by each person in the car for the duration of your trip, you can avoid the temptation of buying something every time you stop to stretch your legs and use the restroom. You’ll save money this way, too. I do suggest reserving the option to buy one “treat” on the road to make the journey more fun, especially for children. Everything from sugarless gum to beef jerky is available, plus, this allows the driver to get a cup of coffee without denying the kids a little something extra. For most of us, the best part of our holiday celebrations is the special meals we get to share with the people we love. Don’t spoil it by overeating while traveling. With a little planning, you can arrive with an appetite, enjoy the celebration, and maybe even play together to release some of the energy you had to contain during your travels! If you’ve been gaining weight and not getting enough sleep lately, some new research suggests the problems are very likely connected. A study published in the European Journal of Clinical Nutrition reported that people who didn’t get enough sleep consumed an extra 385 calories the following day. A 2.5 ounce bag of potato chips or a banana nut muffin can provide that many calories. That’s enough extra calories to gain one pound every 9 days! While sleep deprivation has its own health consequences, the potential weight gain from consistently not sleeping enough is also a concern. How Are Food Choices Affected by Lack of Sleep? In this study, the researchers reviewed 11 other studies made up of 172 participants and compared people who didn’t get enough sleep (3.5 – 5 hours/night) to people who got adequate sleep (7 – 12 hours/night) and what the subjects in each group ate afterwards. What they found was that the sleep deprived people didn’t necessarily eat more, but they did choose foods higher in fat and lower in protein, with about the same amount of carbohydrate. The additional calories in the food choices of the sleep deprived people resulted in weight gain since they weren’t using those calories with increased physical activity. The studies in this review were not designed to explain why people change their food choices following sleep deprivation, but the answer may lie in the reward center of the brain. The results of another study of sleep deprived adults showed greater activation in areas of the brain associated with reward when subjects were exposed to food. This suggests they would be more motivated to seek food when sleep deprived. Another study found higher levels of a lipid in the bloodstream known as endocannabinoid, a naturally produced compound that binds to the same receptors as the active ingredient in marijuana. Activating this part of the brain has been shown to make eating more pleasurable and result in a greater desire for palatable food. How is Appetite Affected by Lack of Sleep? Another proposed reason for the change in food choices by sleep-deprived people is a disruption in their hormones that control appetite, or the desire to eat. The natural circadian rhythms, or biological clock, of the body regulate our sleep-wake-feeding cycles to 24 hour periods. When those cycles are thrown out of sync by external influences, such as staying awake too long, other biological functions of the body are affected. Studies on sleep deprived people have shown they have reduced levels of leptin, a hormone that produces satiety, and increased levels of ghrelin, the hormone that regulates hunger. The change in these hormones in sleep deprived people supports their reports of having an increased appetite, even though they shouldn’t be hungry. How Does Food Affect Sleep? There’s one more twist to the sleep-weight gain story worth mentioning. When certain foods or beverages are eaten at night, they can interfere with the ability to fall asleep, or stay asleep. That can leave you feeling tired the next day. When you feel tired during your waking hours, you may turn to foods and beverages that will help you stay awake, such as those containing caffeine or high amounts of added sugars. This eating and drinking is not in response to hunger, but a way to temporarily become more alert. It not only introduces unneeded calories, but can create a vicious cycle of being overstimulated during the day, and unable to sleep well at night. While there are still a number of unanswered questions, the evidence is growing that sleep and weight gain are connected. Fortunately, the solution for many people may be as simple as pulling down the shades, powering off all screens and turning out the light for a good night’s sleep so you can wake up ready to start the day with your appetite under control. By my estimate, at least 25 percent of the approximately 300 people who filled the theater raised their hands and kept them up for all three questions. At the end of the film when the audience was asked again who believes GMOs will harm you, only two hands went up, hesitantly. What happened in between speaks volumes about the 92 minutes we all spent together in the dark watching the controversy over genetically modified food unfold on the screen while listening to astrophysicist Neil deGrasse Tyson narrate the tale. Food Evolution was presented as part of DOC NYC, America’s largest documentary film festival, which showcased over 250 films in three venues in New York City from November 10 – 17, 2016. The description of the film in the event brochure said, in part, “As society tackles the problem of feeding our expanding population safely and sustainably, a schism has arisen between scientists and consumers, motivated by fear and distrust.” Not exactly a block-buster in the making, but the theater was packed. The film was funded by the Institute of Food Technologists (IFT) FutureFood 2050 program. Their vision is, “A world where science and innovation are universally accepted as essential to a safe, nutritious, and sustainable food supply for everyone.” To celebrate the IFT’s 75th anniversary, they wanted to tell the story about how we’re going to feed the 9 billion people expected worldwide by 2050. The movie opened with footage from several town hall meetings in Hawaii where the issue of growing Rainbow Papaya was being debated. One after another, fearful citizens expressed their concerns about using transgenic seeds to combat the ringspot virus that had decimated the papaya crop on the islands. The responses from elected officials confirmed the fears of the farmers and local population that planting genetically engineered crops would be harmful to their health. It also confirmed how little they knew about the science. We were only five minutes into the film and I couldn’t help but think it was going to be a lop-sided affair. Thankfully, I was wrong. Appearances by Dennis Gonsalves, Ph.D., the Hawaiian native and plant virologist who developed the Rainbow Papaya and Mark Lynas, the British journalist and environmental activist who went from being an organizer of the anti-GMO movement in Europe to a supporter of the technology provided the calm and rational rebuttals to the confusion fueling the controversy. Their remarks were bolstered by the objective and evidence-based interviews with Dr. Robert Fraley, Executive Vice President and Chief Technology Officer at Monsanto and Alison Van Eenennaam, Ph.D., Animal Genomics and Biotechnology Extension Specialist at the University of California, Davis. A hat tip to common sense and levity was offered by the Science Guy, Bill Nye. Those who oppose genetically modified organisms also had their say, from anti-GMO advocate Jeffrey Smith and anti-GMO attorney Andrew Kimbrell to environmental activist Vandana Shiva and food activist Marion Nestle. The levity on that side of the debate was injected by Food Babe, Vani Hari. The true strength of Food Evolution was the way it confirmed everyone’s biases. It left no doubt that genetic engineering is hard to explain and we are uncomfortable with what we don’t understand. It aptly demonstrated that there are many types of truth and people rarely change their minds once they believe something. And it allowed science to play a central character in the story whether we liked and accepted it or not. Which begs the question, whose science was it? Food Evolution tells the story of how we can have a safe and a sustainable food supply by helping us put aside divisive emotional and ideological differences. It shows us a truth we can all share. Having seen other less balanced documentaries on the subject of food production in the U.S., I was pleased to see the fair treatment given to this controversial topic. I encourage anyone working in the food-nutrition-agricultural space to see Food Evolution and recommend it to students, journalists and others who are seeking science-based answers about food. Even if the weather doesn’t vary much where you live, you can use the seasonal changes on the calendar to reboot your diet for better health. All it takes is expanding the colors on your plate to feature whatever is being harvested. I mark the arrival of autumn in the produce section of my grocery store by the orange-hued butternut squash, navel oranges and Fuyu persimmons that suddenly appear alongside all those huge bins of pumpkins. It’s a sure sign that summer is over! According to the American Heart Association, eating a wide variety of different colored fruits and vegetables is the best way to get all of the essential nutrients you need to lower your risk for preventable diseases, such as heart disease, high blood pressure and certain types of cancer. To reach the goals outlined in the 2015-2020 Dietary Guidelines for Americans, you should consume 1-2 cups of fruits per day and 1-3 cups of vegetables per day, based on your age and energy requirements. Reaching those goals is easier if you remember you can include all forms of fruits and vegetables – fresh, frozen, canned, dried and 100% juice. Thanks to rapid transportation, you can find fresh seasonal produce no matter where you live. In the fall, that includes the parsnips grown in Oregon and the Key limes from Florida. Even the internationally tagged Swiss chard, Brussels sprouts and Asian pears are all grown in the U.S. and are being brought to market now, so be sure to look for them in your store. For complete lists of what’s in season throughout the entire year, check Fruits and Vegetables More Matters What Fruits and Vegetables Are In Season? Incorporating more fall produce in your diet is easy if you think about the most popular dishes on your Thanksgiving menu. Do sweet potato casserole, cranberry sauce, and apple pie come to mind? There’s no reason to reserve them just for special occasions, and no reason to prepare them with all of the added sugars typically called for in indulgent holiday recipes. Many of your family favorites can be made using a low-calorie sweetener, like aspartame, to replace some of the sugar. You can find tried-and-true recipes on the websites for your favorite brand of low-calorie sweetener or experiment on your own. The results should look and taste the same as the originals but will be lower in added sugars and calories, which is good for the whole family. Of course, pumpkin isn’t just for pie. I like to stock up on canned pumpkin puree this time of year so I can make these moist and delicious Raisin-Pumpkin Muffins in the winter months ahead. When you eat them for breakfast you can feel good about including your first serving of vegetables for the day in your first meal of the day! Other great uses for canned pumpkin are in smoothies, soups and chili. I also load my freezer with bags of fresh cranberries every fall so I can add them to quick breads when they are no longer in season and to this Cranberry Salad. It adds color and crunch to the plate thanks to the celery and walnuts. And if you haven’t tried pomegranate arils, the seed pod inside a whole pomegranate, this is the time to buy them. They also freeze well and can add some sparkle and extra vitamin C to any salad you serve. When you go apple picking or buy a bushel of apples at a farmer’s market, making a big batch of this Baked Cinnamon Applesauce is a great way to enjoy them well into spring. Just freeze the applesauce in one-quart zip-top freezer bags and then thaw it to serve whenever you want it. Another great way to use up those apples and add more vegetables to your meals (cabbage, carrots and bell peppers) is with this Tangy Apple Slaw. In my house, a grilled cheese sandwich is the preferred side dish to on a chilly autumn afternoon. The leaves on the trees aren’t the only thing that change color in the fall. The fruits and vegetables on your plate should be changing color, too. Here’s to another flavorful season! This post originally appeared as a guest blog in SplendaLiving.com. Like anyone else, I have favorite foods I can eat over and over again and never grow tired of them. Chunky peanut butter is on top of that list for me. But I also like to try unfamiliar foods and am always ready for the next new eating experience that will awaken my taste buds. Many of those experiences have been the result of seasoning combinations that transformed the taste of a familiar food into something original and unexpected, like the first time I had chicken mole. The sauce is made with chocolate, cinnamon and at least three types of peppers, and after one bite that chicken went from ordinary to extraordinary! Given the limitless ways herbs and spices can be combined to create flavors, I think it’s fair to say our enjoyment of food is greatly enhanced by them all. I know I would not want to have to limit the number of spices on my shelf to just three or four of my favorites. The availability of different spices to season our food provides a useful analogy to help answer the question, “What are artificial sweeteners?”, since just as all spices are not the same, all artificial sweeteners are not the same, either. Artificial sweeteners (also known as sugar substitutes, low-calorie sweeteners, or high intensity sweeteners) come from different sources, have different sweetening powers compared to sugar and have different properties depending on what foods or beverages they are added to. Recognizing the different features of these sweeteners makes it much easier to understand what they are and how you can use them, which is also true for peppermint and paprika! In the Go-To Guide below you will find four artificial sweeteners, which are approved for use in the U.S. and available to consumers. Information is provided on their popular brand names, their sweetness intensity compared to sugar, how each sweetener is made, the types of products they’re most often found in, and some of the most popular foods and beverages in which you can find them. When reading the ingredient list on food labels you may notice that more than one artificial sweetener is used in your favorite no- and low-calorie foods and beverages. That is because just like spices, using them in combination with one another provides some foods with the best taste profile. Another feature artificial sweeteners share with most spices is that a little bit goes a long way. Due to their intense sweetening power (compared to sugar), the amounts needed to achieve the same sweetness you would get if using sugar is very, very small. And since they have few or no calories and don’t raise blood glucose levels or insulin requirements, they can be a helpful tool for anyone trying to manage their weight or diabetes. 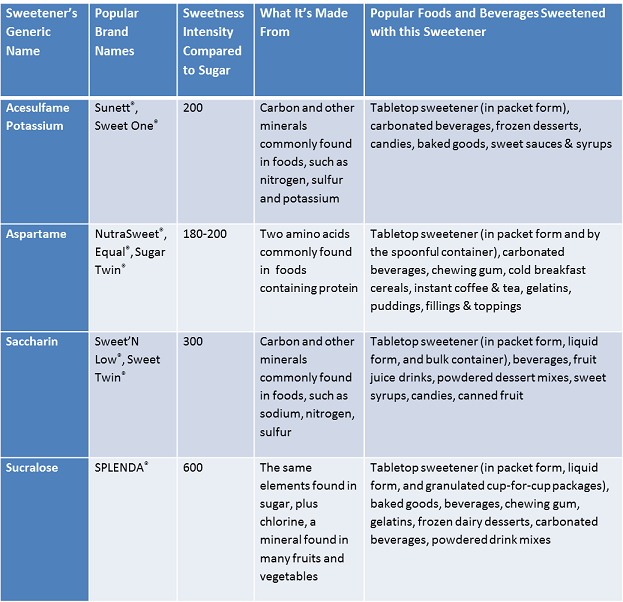 You may also consult the Comparison Chart in one of my earlier blogs for more information about some of these sweeteners. Calorie Control Council. Sugar Substitutes. Soda Taxes vs Dietary Guidelines: Which Can Best Improve Our Diets? This post was written as a guest blog for Americans for Food & Beverage Choice. You can read the original post here. Are you one of the millions of people who eagerly awaited the release of each new Harry Potter book over the past 20 years and snatched up a copy to read as soon as it came out? That sort of describes how registered dietitian nutritionists, like me, feel about the Dietary Guidelines for Americans (DGA). A new edition is published every five years to provide health professionals and policy makers with the latest nutrition science to guide our eating advice for the nation. I know that probably doesn’t sound as exciting as a day at Hogwarts Academy, but it supplies me with many of the tricks of the trade I need to do my job! It goes on to say that a healthy eating pattern should include everything from vegetables and fruits to grains, dairy, protein and even oils. It also says our eating patterns should limit excess saturated and trans fats, added sugars and sodium. This all came to mind as I followed the news of soda taxes being proposed in several cities across the country this year. It made me wonder how taxing sugar-sweetened beverages was going to help Americans achieve the goals outlined in the DGA? Reducing added sugars is important, but it shouldn’t overshadow all of the other ways Americans can improve their diets – or worse yet – lead them to think reducing added sugars is the only thing that matters. And sadly, there may be some evidence of just that.